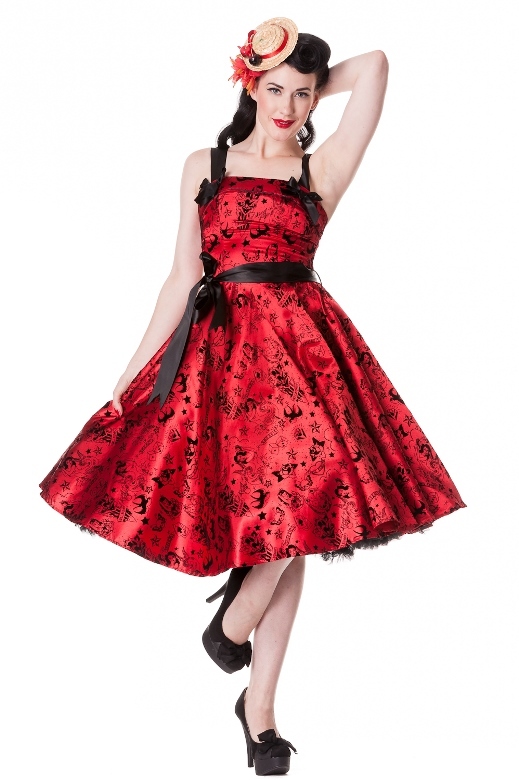 Hell Bunny Plus Size Gothic Red Tattoo Flock Rockabilly Dress [HB5105R] - $72.99 : Mystic Crypt, the most unique, hard to find items at ghoulishly great prices! • Flocked satin 50's style dress. • Flocked design-tattoo inspired with daggers, hearts, mermaids, swallows. • 2 black satin shoulder straps. • Black piping on the top panel of bodice. • Shoulder straps are attached with buttons at the back so that they can be adjusted to fit the wearer. 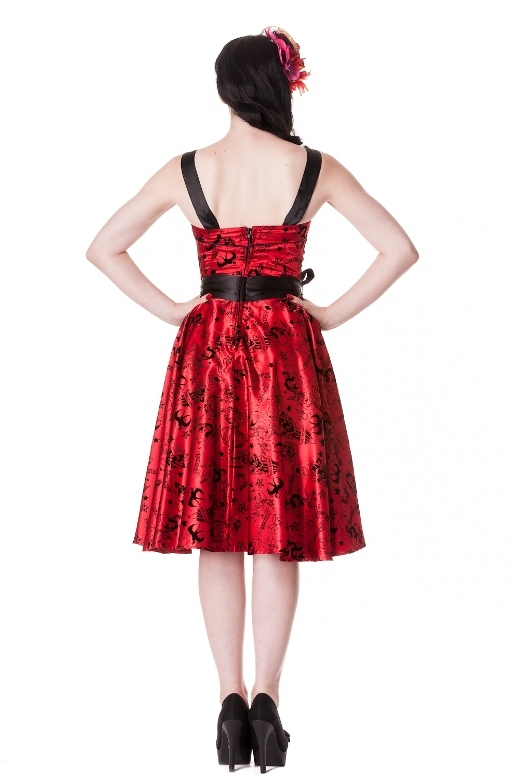 • Black satin bows on the straps at the front. • Zip in centre back. • Black ribbon back tie sewn into the centre back seam. • 100% Polyester, Wash Separately, Do Not Tumble Dry. • Length is 38 inches long. THIS STYLE FITS REALLY TIGHT ON THE BUST, READ MEASUREMENTS BELOW!!! PAY ATTENTION TO THE BUST! THIS MODEL NORMALLY WEARS A 2XL, BUT SHE IS WEARING A 3XL!!! Please read measurements carefully! Most Hell Bunny/ Spin Doctor items run a tad bit smaller than normal. Some run “true to size”, and some run a whole size smaller. We hand measure AND have a plus model try on EVERY item! Each item gets its OWN chart! Click on the skeleton below with the measuring tape that says “SIZING AND MEASURING”, and it will give you detailed instructions on how we measure. Please read measurements carefully, email with any questions! *Model is wearing a 3X* THIS STYLE HAS BEEN DISCONTINUED, THESE ARE THE LAST AVAILABLE!